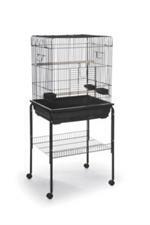 Provide your bird with a place to hide, sleep, play, and feel safe. A place to get away- birds that live in loud households need somewhere quiet and calm to escape. 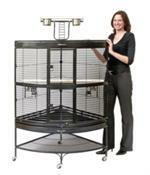 The Prevue Penthouse Suite Crown Roof Cages are designed for small birds such as parakeets, finches and canaries. 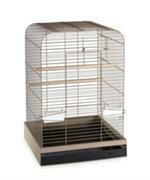 The Prevue Pet Madison Bird Cage is a roomy cage that comes fully assembled. 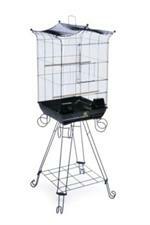 The Prevue Parrot Square Roof Bird Cage, with a large front door for easy access and opens down landing style, offers plenty of room for small parrots such as African Grays and Eclectuses. Let your birds have room to spread their wings and fly! 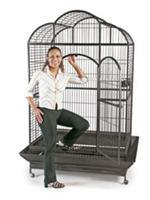 Wrought iron cage that is sized for small birds. Features 1/2" wire spacing. 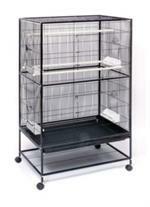 Perfect cage for housing multiple small birds. Solid-weld construction. This is one gigantic bird cage! Made of 9 gauge metal and has a hex bolt assembly to keep large birds from bending, breaking, or unscrewing. 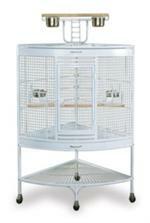 This white, powder-coated finish cage provides generous living space for birds. Its tight, corner fit allows owners to maximize floor space. 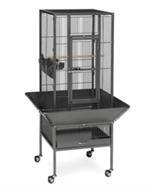 This black, powder-coated finish cage provides generous living space for birds. Its tight, corner fit allows owners to maximize floor space.